Learn how to make your own card games for kids. Learning how to make your own card games is easier than you might think. What's more, once you get the hang of it, you might find that it is quite addictive! You can be a truly thrifty game player by making your own cards prior to designing an original game. This task is made easy thanks to computer technology. Various word processing programs offer templates and graphics that can be used to make homemade playing cards. Simply download a selected template and graphic, print on paper, and cut out individual cards.Another method is to use standard card stock, construction paper or index cards and paste images on one side. If you are designing cards with young children, have them draw or color numbers, pictures or shapes on card-size pieces of poster board or heavyweight paper. Several Internet sites offer help in making your own cards and games. Warpspawn games is a leader in the field. The site provides directions on how to make your own cards, though the creative tasks are left up to you. Using your imagination to design cards is part of the fun. Once the cards are made, the site lists a variety of games that can be played with your homemade versions. Game play directions are posted for those who don't want to take the do-it-yourself card making to the next level. However, you are not limited to playing the games listed. The site offers hints on how you can use your creativity to design your own card games. In addition, you may use the listed titles as inspiration for your own card games. For example, the site lists a game called "Plains Indians." If you choose, you could measure a regular playing card and use that as a template or cut out different shaped cards (e.g. circle, diamond, octagon, etc.) and download an Indian graphic from the Internet to make your own cards for the game. Then, you could either use the directions listed on the site or make up your own rules using the basic strategy already posted. 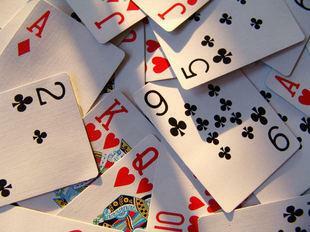 Homemade card games are especially fun for kids with competitive streaks and vivid imaginations. By crafting original cards, kids can choose their favorite images to feature on them. For example, if your daughter loves princesses or your son adores robots, then visit Google Images and download images for the theme they want. Once the cards are made let them use their imaginations to make up their own cards games. They may choose to play a classic card game for kids, such as Memory, War, or Go Fish, but switch up the rules by giving each player two turns in a row or letting the oldest start first instead of the youngest. If your children are very young, opt for a card throwing game. Simply, divide a deck of cards (traditional or homemade) in half, separating the red cards from the black, and have your children pitch them into an empty cardboard box. Place the box about four to six feet from the kids and see how many each can get in by alternating throws. Cards that land on the floor outside the box don't count. Whoever gets the most cards in the box at the end of the game is declared the winner. Card game enthusiasts, who become obsessed with making original versions of traditional games, can take their ideas to new heights thanks to outsourcing companies. If you are tired of handcrafting unique playing cards from paper and laminating them to prevent them from ripping, then you might consider visiting The Game Crafter.The company lets you design your own fun using their professional services. Simply upload the art assets you'd like to have printed on your game cards, pick out any additional accessories that should be included (timers, dice, scorecards, etc.) and write out the game's rules. From there, you can either order the cards at cost for yourself or set a sale price and sell it on the site's integrated store. Cards are printed on thick card stock in full color, but the company uses wax instead of ink, which can lead to blurrying issues. In addition, the card printing isn't exactly perfect, and there's a chance some parts of the card's far edges will be cut off. Still, considering there is no up-front cost (the site covers printing fees, but takes a 50 percent cut of the profit sales), it's not a bad option for serious playing card designers. As you can see, you have several options for creating your own cards, but the best part is that however you make your cards, you're sure to have hours of fun!